Senior Helpers - a home health care agency. This will be a discussion on what kinds of services these types of agencies offer and how they differ. 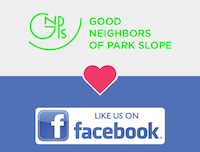 Good Neighbors of Park Slope does not promote, endorse or advertise for any private business, however we do sometimes partner with local businesses so they can share their expertise. you if there is any change in schedule. The venue for this event is fully accessible. Please contact us for more information on accessibility.